In 2006, Salesforce handed Erica Kuhl, their Director of Community, a website. The site was Success.SalesForce.com and Erica started as a Web Producer, namely because roles within community didn’t really exist yet. In 2010, Salesforce ripped out everything and started from scratch and rebuilt the site into what it is now. In the early days of building community, Erica used tried-and-true methods such as hand-written Thank You notes and gave presents to key power users and asked them to join her on the new platform. “We didn’t want this community to be the ‘Developer community,'” Erica stated, “It’s scary for people to see lots of code.” They had a much more specific aim. Erica calls what has happened this year “insane growth,” built with the hard work she has put in over the previous eight years of community building efforts. Salesforce’s timeline and corresponding numbers were so impressive, that her supervisors and the whole team stood in awe of the growth. July 2013: Launched a community product and then launched a community on that community product. Jan 2014: They had 1M users. 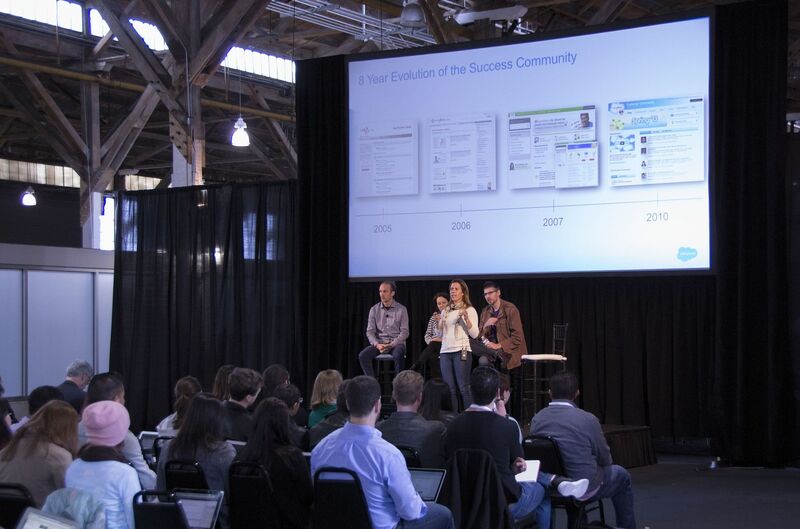 March 2014: Dreamforce community joined the pre-existing community that Erica helped build. What drives this impressive adoption? To Erica, community means “peer-to-peer success”, collaboration, and brand advocacy, the latter of which she’s clearly leveraged to Salesforce’s advantage. Measuring ROI for community within your company is possible and Erica Kuhl is living proof that it can be done. Her next challenge will be selling community to Salesforce’s internal employees.